approx. height 7.85 inches (20 cm) and approx. weight 2.1 pounds (950 gr). 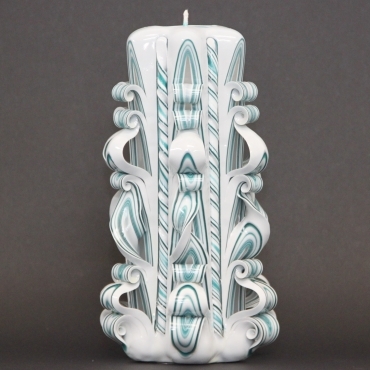 It is a white candle with thin turquoise stripes all over. Carved layers are also with turquoise stripes. Express delivery to the USA, door to door! From my past experience it takes approx. 8-12 days (from the day of pickup) but takes longer during holiday periods.Because shipping is not unders my control, I cannot guarantee timing.Each candle is shipped in a separate parcel. 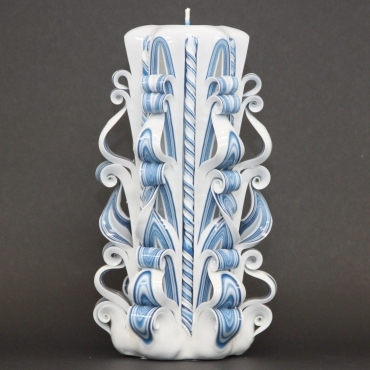 CARVED CANDLE – As ALL my candles, this carved candle is also my handmade masterpiece, based on an artistic style, from a period which began around 1600 in Rome, Italy, and spread to most of Europe – the Baroque! As a person who appreciates special art styles I have spent a lot of time studding various methods, old and modern technology. 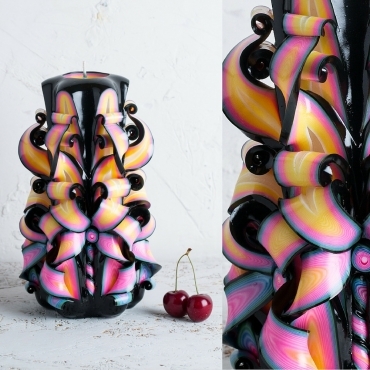 Adding my imagination, passion, and love to all this, I was able to create the best art product – this unique Carved Candle - especially for you. SHIPPING – Each candle is shipped in a separate parcel. If you order more than one candle, they will all be shipped on the same day in separate parcels and hopefully also arrive on the same day. My candles are ready to be shipped usually within 3-5 days. They are very neatly packed to ensure safe delivery to you, each in a separate parcel. Delivery to the USA and Europe usually takes approx. 1-2 weeks, to Australia approx. 2-3 weeks. PAYMENT – You may use PayPal or credit cards. I am fully bounded to a strict secure international payments policies. Therefore, your payment is 100% secured. 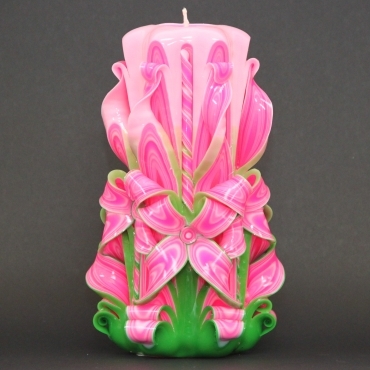 CUSTOM ORDER – You can tell me what you like and I will do my best to make a Carved Candle especially for you. You may want to order it for a birthday, wedding, any ceremony, anniversary, Mother’s day, Father’s day, holidays, Christmas, Valentine’s, Halloween, etc., for a romantic eve, or as a gift for someone special. Just tell me what you want. EVECANDLES MASTERPIECE – So you ask yourself “how does Eve do it?” Obviously, I will not teach you this art in a few lines, but I will give you its highlights. • Firstly I prepare the core of the candle from high quality paraffin. • Then I coat it with layers of colored paraffin by dipping it into various buckets – each bucket with melted paraffin and different color dyes. • Once it is coated, I have only up to 20 minutes to carve and complete it. • Each stage must be performed under full control and monitoring of materials and environmental temperatures. Incorrect temperature of melted paraffin, cooling water, or even the environment will lead to failure to successfully complete the carving. • The last stage is to cover the candle by acrylic lacquer to make it shiny and give it a layer of protection from heat, dust, and water. • If your candle gets covered in dust, you can wash it with water. • If you don’t want to burn this candle, you can place a tea light on top of this candle, and light it up instead of the wick. 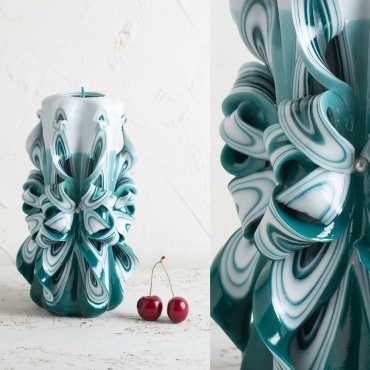 HANDMADE ART - Each candle is exclusively my handmade art. 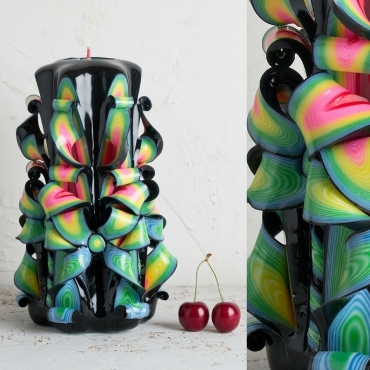 No machines are involved in this masterpiece, therefore each candle is unique and slightly different. 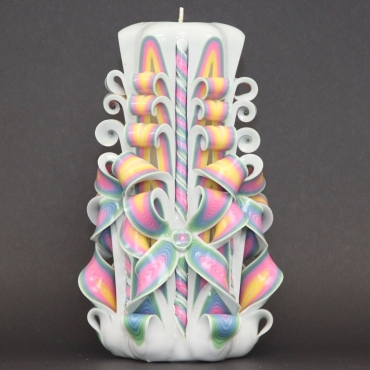 Candles may also slightly differ in material density, size, weight, form, and colors. It is also important to notice that colors in photos and on computer/tablet/notebook/smartphone displays are always slightly different from reality. Therefore please understand that what you see on your display is an excellent indication of the product, but might be slightly different in reality. 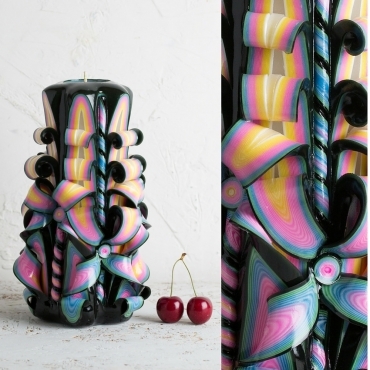 REFUND OR EXCHANGE – As mentioned above, all my candles are very neatly packed to ensure safe delivery to you. However, if the candle arrives damaged, please take a photo of the damaged box with the candle and send it to me on its arrival day. I will either offer you an exchange or a refund. • Never leave a lit candle unattended. 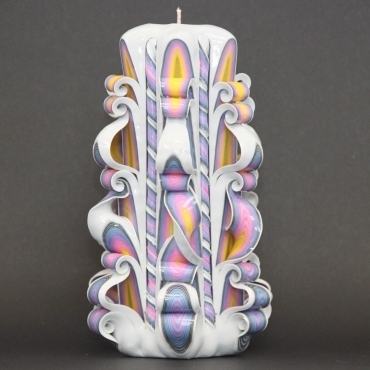 • Prior to lighting the candle its wick must be cut to the length of 1/4 inch. • Pieces of neither matches nor any other objects should be left near molten paraffin. • Keep away from children and pets. • Do not place in the wind, direct sunlight, close to a direct heat source, or next to flammable materials. • Place candles on a stable and nonflammable tray which prevents paraffin leakage. • Place the candle with the tray on a nonflammable surface. • Do not touch and/or move the candle while it is lit or hot. • Packaging and labels must be removed before lighting the candle. • On candles with more than one wick all wicks must be lit at once.